The Buggy Factory will be one of many participating venues in the second iteration of this international exposition—produced by Centotto, Theodore:Art and London-based Sluice_— in which artist-run galleries in Bushwick share space and work together with artist-run projects or galleries on visit from outside NYC or abroad to produce individual and collaborative exhibitions. Enrico Gomez of the Dorado Project will be working together with Grey Cube Projects, based in Bogotá, Colombia; 12ø, based in London, England; and Proto Gallery, based in Hoboken, New Jersey. The curators and artists involved with these four gallery projects will take over the exhibition space of The Buggy Factory from 20-23 October 2016. Their collaborative exhibition will be on view from 12-6pm daily. There will also be a series of talks by artists and curators on Sunday, 23 October, at 3pm. Much more information about the Exchange Rates expo can be found here. curated selections from Bushwick and abroad. 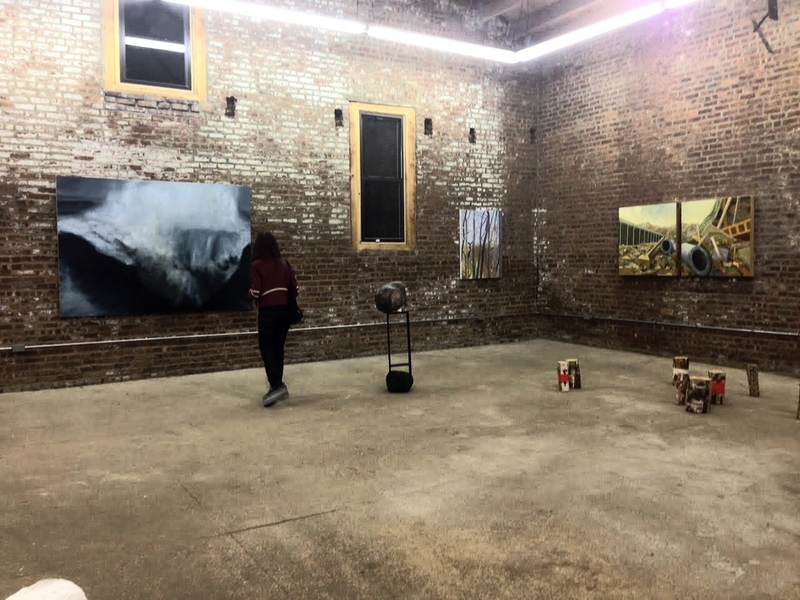 In celebration of Bushwick Open Studios 2016, The Buggy Factory will host a sampling of greats from nearby artists interspersed with artworks from creators located just outside the geographic demarcations of this universal conversation. This sun-filled, historic carriage house will be installed with works that, at first pull, seemed like core emblems of the amazing talents on offer from these seven artists. Further looking revealed several shared or simpatico through lines including a varied exploration of the human form, a focus on vibrant and lustrous color, and an interest in the tactile qualities of their chosen materials. The title, taken from the Wim Wenders art house cinema classic, alludes to art's gentle ability to permeate membranes of separation, establishing connection and inspiration independent of distance, time, or space. Oh yeah, and angels. There were angels in the film and, as it happens, we’ve also a few. More information about this exhibit can be found on the Dorado Project website. Link here. A Centotto drawing session was hosted by The Buggy Factory on the afternoon of 31 July 2016. Images courtesy Centotto. More information and images at centotto.com. The Dorado Project at The Buggy Factory presents What Remains, a grouping of three artists, Bert Benally, Antonia Perez, and Claudia Sbrissa, who are engaging themes of legacy and inheritance, be it personal, cultural or ecological, within their own art making. Contributing to and expanding upon these concerns through their own inquiry and undertaking, the artists ofWhat Remains offer site-specific installation and sculpture, crocheted wall-mounted works and Navajo sand painting in the context of an 18th century 2 story exposed brick carriage house in the heart of Bushwick, Brooklyn. A Centotto exhibition hosted by The Buggy Factory. Paintings by Jeffrey Bishop and John Descarfino. A sculpture by Tom Butter. Sculptures by Oliver Jones, Dave Henderson, Nathaniel Lieb and Jack Henry. The Dorado Project, at The Buggy Factory, proudly presents De Colores, a group art show featuring Inna Babaeva, Andrea Bergart, Jennifer Ditacchio, Ben Godward, Doreen McCarthy, Anne Russinof, andDenise Treizman, which celebrates the myriad attributes and effects of color. Taken from the Mexican folk song and un-official theme of the United Farm Workers Union, the title alludes to the celebratory and life-affirming qualities of color, expressed within the show along aesthetic lines. The song was employed to unify workers and buoy campesino spirits during protests and long fights for justice. The lyrics include seasonal and environmental references that were readily identifiable, communal, and uplifting and the heartening, stimulating visual characteristics of “the great love of infinite colors” is also soundly evident here. The artists within De Colores, though coming from multiple individual concerns and practices, share a deep affinity for color and an appreciation for its impression and efficacy. Bands of aqua and white within the paintings of Jennifer Ditacchio connote landscape and movement while layered swaths of gestural and intersecting mark fill the frames of Anne Russinof’s gem-like works. Like three-dimensional brushstrokes writ large, the inflatable sculptures of Doreen McCarthy posses a keen and contradictory sense of gravity and weightlessness while the works of Inna Babaeva commingle everyday objects, industrial foam and spectral hues to surreal and fantastical effect. Ben Godward’s art, through accretion, offers vivid cues to his creative concerns including gluttony, product marketing and consumerism. With references to fabric design, gestural abstraction and 80’s pop, the paintings of Andrea Bergart gleam with vitality and the multi-disciplinary works of Denise Treizman mix found objects, paint, and a heightened color palette for results that straddle the demarcations between artistic disciplines. De Colores offers a song of color to kickoff the summer season, to salute the 9th Annual Bushwick Open Studios, and to acknowledge the vibrant talents of seven deeply imaginative and brilliant artists. 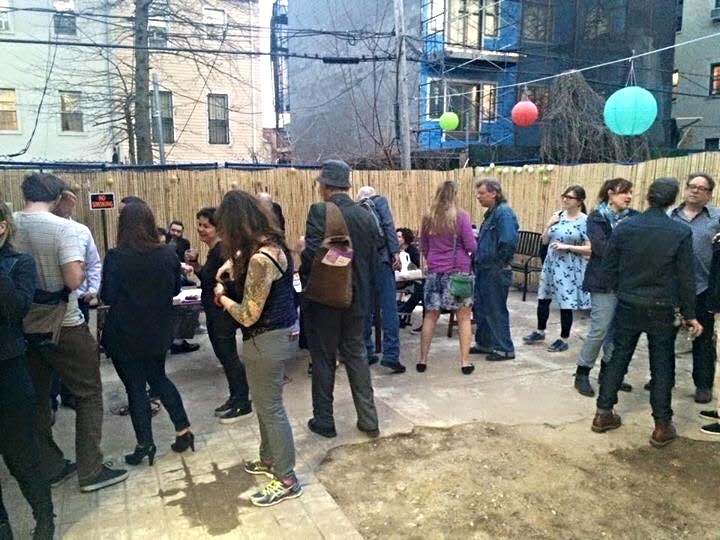 This is the second art event at The Buggy Factory which will serve as an official BOS2015 HUB for the 9th Annual Bushwick Open Studios event; one of NYC’s largest arts and cultural events boasting over 500 individual artists studios, galleries, and performances over 3 days, more info at: www.artsinbushwick.org . During the festival, The Buggy Factory will offer free printed maps of the festival, light refreshments, and both and Opening reception and Closing Brunch for the artists of De Colores and visitors. Closing Brunch: Sunday, April 19th, 12 – 3pm. Taking as its inspiration the buggy, the original product of the show’s historic, 19th-century buggy factory/barn location, this show reflects on the human movement of goods and services across land, and the effect of “progress” on the environment. The title Passing, Left, refers at once to the convention of speeding by other travelers in the “fast lane” of our country’s highways as well as the passing of time and to what our collective advancement and the planet’s development trajectory leaves “left” in its wake. Boston-based artist Andrea Sherrill Evans shows works concerned with human-sourced designations upon the environment; decisions such as where trail markers are placed and which wood is to be used for firewood or building materials, etc. Evans’ practice re-directs the human gesture and re-purposes it with regard to the environment, overlapping the arbitrary and purpose-filled with the generative and the reconciliatory. Artist Kathleen Vance shows works from her “Traveling Landscapes” series; vignettes of natural landscapes fabricated within aging steamer trunks and valises, which reference the human desire for and timelessness of place. These works encompass notions of “the pastoral”, land rights, belonging and province. MaryKate Maher, an artist based in Bushwick, pulls information from her immediate surroundings as well as from memory/imagination for works that seem to exist in the intersection between the natural and the man-made. Geode rock shapes balance precariously with steel frames and corrugated planes, combining material components in ways that subvert the proto-typical reads of heavy/light, soft/hard, and constant/ephemeral. The two-dimensional works within the show seem to connote temporal moments during, just before, or just after some great event. The paintings of Kerry Law are time specific and ever changing in that they are generally executed alla prima; direct observation in one session. In his works we see the familiar subjects of landscape truisms; trees, the ocean, sky, but within these still and frozen instances are records of the ever-changing subtleties of nature. Karen Marston, by contrast, depicts scenes of great upheaval and dramatic change within her “Disasters” series; oceanic swells, forest fires, and tornadoes which foreground the inspiring beauty of nature and impact of the larger movements within its oeuvre. The paintings of Anna Ortiz seem to record the moments just after some great natural or man-made occurrence. Concrete slabs, clumps of tree, brick and wood co-mingle in an eerily still space, equidistant between abstraction and reality, and displaying a quietude that belies the violence that the depicted subjects seem to imply. Jennifer Ditacchio shows works, inspired by nature, that seem to exist in the space between the observed and the imagined, the fantastical and the real. Here abstract masses seem to float, evoking clouds or islands with an implication of directional movement; less exterior expedition than internal pilgrimage and resolution. While the creative movements of these artists remain their own, Passing, Leftintends to offer at least one position with regard to their work, an opening into a deeper examination of and appreciation for these artists’ endeavors and the myriad of courses and routes they may take to arrive at their singular destinations. Passing, Left is the inaugural art event at The Buggy Factory and is proudly presented by The Dorado Project.